In this heartfelt, humorous page-turner, Samantha Newman desperately needs a new job, a place of her own, and a fix for her rocky romance with cyber-security expert Carter Chapman. 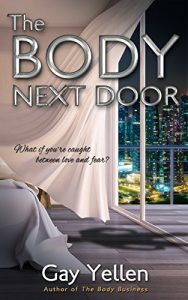 But with a dead man next door, and his wife holed up in Samantha’s apartment, Sam gets dragged into the investigation. To make matters worse, there’s a stalker haunting her balcony. Could it be the real killer? When the investigation ruins her chance for a great career and a happy future with the man she loves, she risks everything to try to solve the mystery herself. Chanticleer Mystery & Mayhem Award-Winner and Readers’ Favorite Mystery Award-Winner. Jennifer Marsh is back in DYING BEFORE “I DO”! This 7th installment in the delightful JENNIFER MARSH MYSTERIES is sure to satisfy fans of the series. All of Jennifer’s writer friends–Leigh Ann, Teri, April, and Monique–plus Emmie Walker and Muffy are back to help Jennifer plan her wedding and solve the mystery as bullets, arrows, and poison threaten to derail it. Dying Before “I Do” is the seventh in The Jennifer Marsh Mystery Series. Readers asked me to write another in this cozy mystery series, and I was very happy to once again find myself in Jennifer Marsh’s world. Jennifer is an unpublished mystery writer with a group of zany writer friends who are always willing to jump into the fray to help Jennifer solve whatever crime she’s currently involved in. In this book Jennifer and long time beau are finally getting married. The mystery part of the book, which involves an old kidnapping case, started out with my usual “what if” inspiration. Why are people suddenly dying and in danger over something that was over and done with four years ago? What if the kidnapping was more complicated than it at first appeared? I love mysteries that challenge me to write them and this was one of them.